Their songs haunt the deepest depths of the ocean and their behaviors have intrigued scientists for generations. The humpback whale itself is a mystery in many ways, such as having no real visible age indicators after they are one year old. Studying the age characteristics of sensitive animal populations can provide valuable ecological insights into questions of reproductive success, lifespan, survival trends, and more. In recent decades, marine biologists have used different methods to measure age in certain whale species. However, most have notable limitations. For example, the age of deceased whales can be estimated using various invasive biopsy techniques, but doing so precludes the monitoring of living subjects over time. Alternatively, researchers attempted to measure the age of live whales using telomeric genetic markers, but those methods suffer from a lack of specificity and too much technical noise. By contrast, a number of recent research articles demonstrated that DNA methylation-based age estimators, commonly referred to as epigenetic clocks, are a highly accurate and technically robust means to measure aging in mammalian species as diverse as mice, canines, humans, and other primates1-3. A group of researchers in Australia now show that DNA methylation analysis is an effective way to help predict the age of living whale populations, thus providing a new tool to study the demographics of these majestic ocean leviathans. In their study, Polanowski et al.4 noted the development of DNA methylation-based age clocks and set out to develop a similar test for use in humpback whale (Megaptera novaeangliae) research. They focused on the evolutionarily conserved 5’ regulatory regions of genes whose changing DNA methylation patterns correlated with age. The authors first generated a calibration data set using a cohort of 45 humpback whales originating primarily from the Gulf of Maine and with known ages ranging from a few months up to 30 years. Importantly, the tissue sample source used in the analysis came from minimally invasive skin punch dart biopsies. 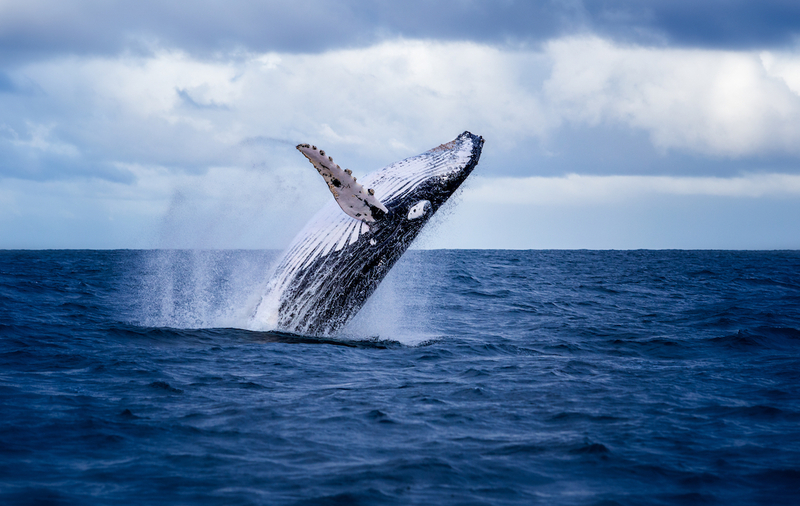 The scientists called their new experimental tool the Humpback Epigenetic Age Assay (HEAA). Application of their 3-gene test demonstrated a high positive correlation (R2 = 0.787) between DNA methylation change and age. Furthermore, a leave-one-out cross validation from the calibration cohort data set demonstrated precision and accuracy (Mean difference = 3.75 years; Standard deviation = 2.991 years) between the predicted and known ages of the samples. Having established the HEAA, Polanowski et al. then set out to test their model on a humpback whale population of unknown age composition. 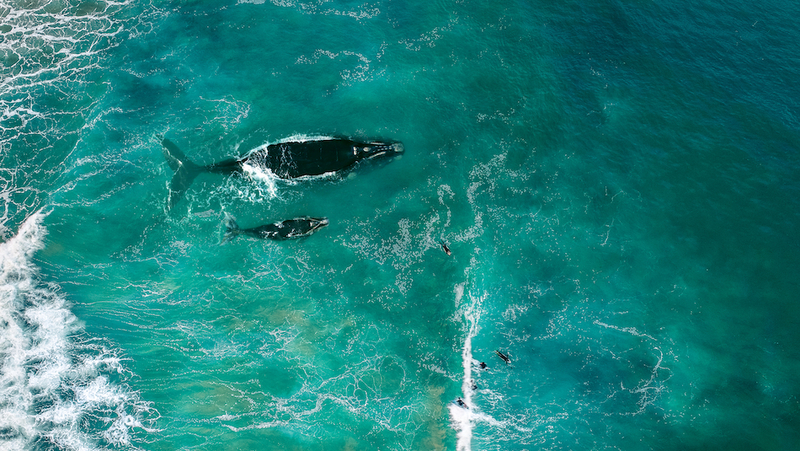 Using skin biopsies once again, they measured the epigenetic ages of 63 humpback whales migrating north near Evans Head, Australia, and observed an average population age of 10 years, with a total age range from 0 to 52 years. The authors further noted that the distribution of the measured ages resembled what would be expected for a sample population of that size and in that region after comparing their dataset to one obtained in the same area 50 years earlier, before the effects of whaling caused the fishery to collapse in the 1960s. One final test of the HEAA showed its ability to correctly pick the ordinal age-relationship between parent and progeny in both data simulations (<90% accuracy) as well as an empirical test of mother-calf pairs taken from the test and calibration data sets, respectively. The assay proved accurate in all 12 pairings tested. With the HEAA, Polanowski et al. present an epigenetic clock similar to what has been shown to work so effectively in other mammalian species. Initial calibration and testing of the HEAA demonstrated its broad precision, accuracy, robust nature, and compatibility with a minimally invasive and readily obtainable sample source. Continued use of the HEAA, or similar DNA methylation-based age estimators, will help scientists track the overall health of whale populations well into the 21st century. Horvath S. DNA methylation age of human tissues and cell types. Genome Biology. 2013;14(10): R115. doi:10.1186/gb-2013-14-10-r115. Petkovich DA, Podolskiy DI, Lobanov AV, Lee SG, Miller RA, and Gladyshev VN. Using DNA methylation profiling to evaluate biological age and longevity interventions. Cell Metabolism. 2017;25(4);954-960.e6. doi:10.1016/j.cmet.2017.03.016. Thompson MJ, vonHoldt B, Horvath S, and Pellegrini M. An epigenetic aging clock for dogs and wolves. Aging. 2017;9(3):1055-1068. doi: 10.18632/aging.101211. Polanowski AM, Robbins J, Chandler D, and Jarman SN. Epigenetic estimation of age in humpback whales. Mol Ecol Resour. 2014;14(5):976-87. doi: 10.1111/1755-0998.12247.